Discover the charm and mystique of New Orleans when you stay at this 3-bedroom, 3-bath vacation home, ‘NOLA Place’, that sleeps 6. 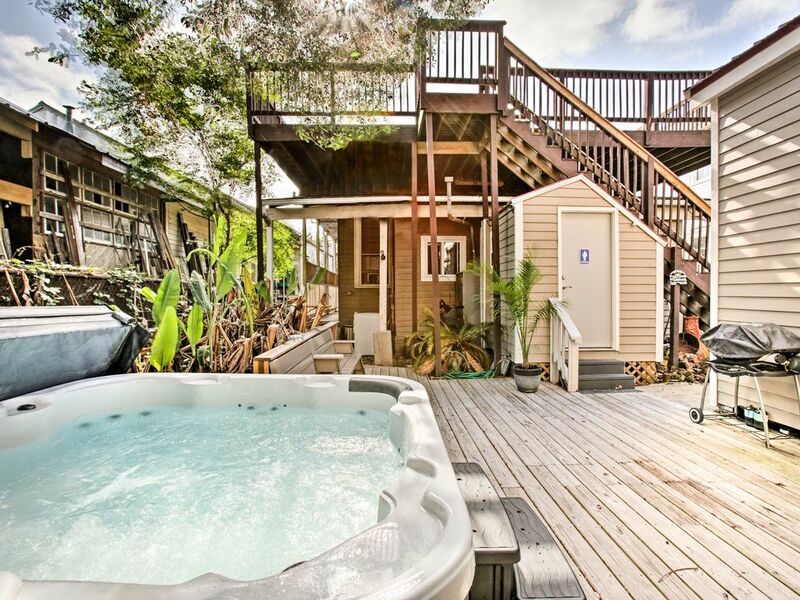 Wander the French Quarter by day and retreat to one of the 2 decks at night, where a hot tub, plenty of seating, and skyline views lull you into a New Orleans state-of-mind. Bars, restaurants, festivals, and parks are within walking distance! Bask in the excitement of New Orleans as you approach the charming 'NOLA Place.' As soon as you arrive, step inside to make yourself at home amidst the 1,800 square feet of living space. If the weather keeps everyone inside, you’ll find plenty of entertainment down in the game room. With a 55-inch flat-screen TV, virtual bowling on the Xbox, and a pool table, you’ll never have to deal with boredom. In the afternoons, pour yourself a glass of wine and head outside. On those chilly afternoons, soak in the hot tub to let all your stresses slip away. Nestled in one of the oldest sections of New Orleans with a bustling local life, you’re in the midst of all the excitement. Within walking distance, you’ll find Satsuma for a farm-fresh breakfast, Bratz Y'all for authentic German food, Bacchanal Fine Wine and Spirits for small plates and live music, and Markey’s Bar, where you can meet all the locals. The Country Club is just 2 doors down, where you’ll find a bohemian-style pool area with a poolside bar and outdoor kitchen, as well as a beautifully renovated restaurant for fine dining. In the morning, cross the street to the newly developed Crescent Park. This beautiful park allows you to walk along the Mississippi River to the French Quarter, with stunning views of the shipping activities and the New Orleans skyline. Continue walking through the park to New Orleans’ oldest neighborhood, the French Quarter. This neighborhood is filled with history, charm, and plenty of local shops, restaurants, events, and nightlife for everyone to enjoy! With river walks, bike rides, numerous festivals, swamp tours, historical walking tours, haunted tours, and so much more, New Orleans is a prime vacation destination. Whether you want to walk, uber, or tour the city via horse drawn carriage, you’re ideally located to explore it all. - Amenities include a kitchen, game room, pool table, Xbox, 2 flat-screen TVs, DVD player, deck, outdoor and indoor dining areas, ample outdoor seating, private hot tub, screened porch, iPod dock/Bluetooth speaker, ceiling fans, and more! - Unbeatable New Orleans location - Walking distance to restaurants, shops, bars, parks, museums, the Mississippi River, and so much more! Just 1 mile to the French Quarter! Jim was an amazing host, he made checking in super easy and comfortable! The house was perfect for our group of 6, we loved the rec room and hot tub. The location couldn’t have been more perfect, very close to the action of the French quarter but it a nice neighborhood with all kinds of restaurants and bars in walking distance. I can’t wait for my next visit to New Orleans. I’ll definitely stay at Jim’s house again.! We were a party of six in town for a conference and were all blown away by the space and Jim's wonderful hospitality. Since there was no one staying in the house prior to our arrival, Jim let us check-in extra early (MANY THANKS, again, Jim) and also let us store our bags in the game room after checkout so we wouldn't have to haul them all over the city prior to our flights. All of the beds are super comfy and the house itself is very spacious. There are several sets of keys and a lockbox, so if you're traveling with a group who plans to come and go at different times, know that access was not an issue at all. As other reviews have point out, the hot tub is INCREDIBLE--it's spacious and is kept to high-quality standards (Jim himself checks the chemical, Ph, and water levels to ensure it is always in tip-top shape). Finally, the game room is an excellent bonus and the fenced in patio right off of the game room was a favorite spot for us to hangout. We could enjoy the Nola vibe without the Nola bugs. Easily walkable to Frenchman and walkable (though a bit further) to the French Quarter (we took Ubers most of the time, which ranged from $6-10 a ride). If this place is available during your trip, book it now! I hope to stay here again next time I'm in New Orleans. Perfect place for our group of friends. Very nice and safe neighborhood, felt comfortable walking around. Jim our host was incredibly nice and friendly. He went above and beyond to make sure we had a great time in New Orleans. Would absolutely stay here again. This place is a great house for a girls trip! Plenty of sleeping space for a group - comfy beds. The detached game room was ideal for hanging out as a group. The private screen porch and patio were ideal for morning coffee and breakfast. The large hot tub was clean and super awesome after a long weekend of walking around the city. The owner Jim was very attentive and helpful and made sure we had a great time. We would definitely stay at his place again. We (three 60ish year old couples) recently had a very nice 3 night stay here in February 2019. Jim, the onsite owner, was a pleasure to deal with and was quick to provide us with anything we needed. The house is located in a nice quiet older neighborhood about 10 blocks north east of Frenchman St and 1.7 miles from the north edge of the French Quarter. We walked to the French quarter and back along the river walk during the day and took Uber during the night. Uber rides cost us around $10 each way. There are several local pubs and coffee shops within a few blocks of the house which was nice. The house itself is unique as many of the older New Orleans Shot Gun houses are where the bedrooms flow through one another. This style of house has plenty of local charm but understand that there is limited privacy in the design if that is a concern to you which it wasn’t for us. The house was clean and well-kept with a smaller kitchen and 2 indoor bathrooms and 3rd bathroom located outside in the patio area. The highlight of this property is the large games room in the back yard, separate from the house, which has a nice large table, couches, a big screen TV, pool table, darts board, Bluetooth sound bar and fridge and bar area. This is where we ate breakfast every morning as the kitchen doesn’t really accommodate 6 people to sit and eat comfortably. There is also a screened in porch and an outdoor deck area which is nice. There’s also a small BBQ which we used one night and a hot tub in the back yard. Overall we had a great stay here and Jim was a great host and he will do whatever he can to make your stay a memorable one. The location is very good as were the rental rates. We would definitely stay here again on a return visit. Cheers Jim and thanks for everything. This booking was even better than I originally expected. Plenty of space and the hosts went out of their way to accommodate us. The only thing I’d mention that I didn’t know going in is that the second and third rooms are arranged in such a way that you need to walk through one to get to the other. Even this wasn’t a problem, just something I would note.